This entry level class is designed for all new Krav Maga students. The goal of the class is to teach the basics of self defense and fighting. Students will learn Krav Maga’s fighting stance and movement, various punches, kicks from standing position as well as from on the ground, elbows and knees, and how to defend against punches, chokes, headlocks and wrist grabs. Students who train an average of two times per week should expect to complete the curriculum in four months before testing into KM Level 2. Yellow Belt is the first stage in learning our Krav Maga curriculum. If you attend class at one of Krav Maga Worldwide’s certified schools, you will start here at Yellow Belt, or “Level 1.” The average training time for this level (assuming at least two training sessions per week) is four months. The curriculum at this level introduces basic strikes such as straight punches, elbows, front kicks, and knees – the meat and potatoes of a street fight. You’ll also learn how to deal with common chokes and headlocks. 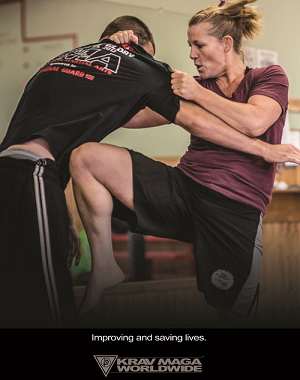 In addition, the techniques here offer a clear representation of the principles of Krav Maga – ideas such as explosive movements, instinct-based responses, and simultaneous defense-and-counterattack. Krav Maga defines “combatives” as the ballistic techniques used both in fighting and in self-defense. The bulk of these techniques involves punches, kicks, elbow strikes, and knees, but Krav Maga never excludes other combative actions such as biting and scratching. Think of combatives as tools to help you in a fight. They are an integral part of self-defense. Even if you’re interested in Krav Maga only for self-defense and have no interest in fighting, you must learn basic combatives. While Krav Maga self-defense techniques address the danger, combative techniques are vital in order to eliminate subsequent threats. The combative techniques described here are designed to cause sufficient damage to the attacker in order to remove further threats, while keeping you relatively safe. Krav Maga defines “self defense” in simpler terms: The attacker has commited himself to an attack, while you are unprepared, forcing you to respond to an immediate threat from a position of disadvantage. While such defenses as 360″ Defense and Inside Defense could be put into the self-defense category when used as reflex reactions against a surprise punch, in general, the self-defense category covers defenses against chokes, bearhugs, headlocks and other holds. In more advanced phases of training, self-defense will include responses to knife and stick attacks as well as threats with a handgun. Be based on natural instincts/reactions. Be simple and usable by people of different strengths and body sizes. Work from a position of disadvantage or poor state of readiness. Include a simultaneous (or nearly simultaneous) counterattack to neutralize further attacks. Be comprehensive enough to cover a wide variety of scenarios. At times, a less-damaging technique may be the appropriate response to a situation. Example of such situations include one person simply trying to delay another; a drunken but otherwise harmless acquaintance at a party; and a person holding onto a wrist and unaware of the defender’s urgent need to move away. For these instances, “soft” techniques are designed to remove the defender from any potential danger without harming the other party. These techniques are to be used only if you feel no real threat. If you feel you are in danger, “harder” techniques (especially combatives) should be used. Krav Maga assumes that, even if the attacker does not try to take you down, you may slip and find yourself down while the attacker is up. This section introduces basic groundfighting positioning and movement. Among the techniques are three basic kicks from the ground: front kick, round kick, and side kick. This overview courtesy of the book Complete Krav Maga.